The subterranean approach had a long history, stretching far back into the Middle Ages - and earlier. Safe from objects and substances hurled down by the besieged, attackers dug right under a wall or tower of a castle, excavated a chamber while they propped up the base of the structure above with wooden posts and pilings. After a chamber was deemed sufficiently large, the supports were set afire. As the wood burned, the support for the stonework fell away to have that part of the castle collapse. That very procedure was continued after 1494. But a variation was added: gunpowder in a chamber at the end to blow up the structure, not simply undermine it. An explosive charge under the wall was first employed in 1487 by the Genoese attacking Serezanella. Wherever the ground permitted it, mining was considered for a siege. Only if the artillery fort rested on solid rock or the water table too high was mining not contemplated. For our period, attackers started their mines at the edge of or close to the glacis. Of course for work to proceed that near to the artillery fort, its cannon had to be sufficiently quieted and the garrison weakened enough to allow digging. Period illustrations show that either a vertical shaft or a slanted tunnel was dug to reach the desired depth. A vertical shaft required less digging, hence less time, than a slanted tunnel. Only if a large body of soldiers would be required to pass through the mine and out another opening would a slanted tunnel be necessary. For a relatively small number of workers whose intent was to place a charge or to set fire to supports, a vertical shaft was practical. John Muller recommended the shaft be "...7 or 8 feet square, and about 18 or 20 deep... from thence galleries are carried on towards the covert-way (a.k.a., covered way), of 4 feet wide, and 5 high..."** A hoist may have been put above and/or ladders placed down on the shaft wall. How far to dig a gallery toward the intended target was determined beforehand when, usually at night, someone crept close to the above-ground structure, and then threw a weight toward it with a string attached. If the weight landed at the base, then the string was drawn taut, marked where the thrower was, then reeled back in and measured. The distance to dig was that length from the weight to the mark on the string (and adding a little to get under the target) plus whatever distance the thrower had crept up from the proposed place for the shaft. Trigonometry also worked for those who knew how. If they were available, commanders of besieging armies preferred to employ men with mining experience to construct the mines. Their place of origin was considered secondary to their knowledge. For example, the French hired Cornish miners for several siege operations and the Spanish hired Bohemians. Many of the tools were the same as those for making trenches and saps. A sap led to the mine shaft. Protection was thrown up around the top of the shaft, similar to what was done for saps. After going down five to six meters, miners next dug horizontally toward the targeted wall. Click here for x-ray vision, to see a mining operation underground, complete with chamber at the far end to contain a powder charge (or wooden supports holding up the wall's base). Double click that link to return to the topside view. From the vertical shaft, miners bored their gallery toward the place where they wished to cause a collapse, their direction guided by a compass. They used a level to maintain the same depth as they dug. Any turn was planned and measured with a square. Any gallery could be kept straight by keeping a candle burning in the middle of one end and all miners kept an eye on that to spot any deviation in their progress. 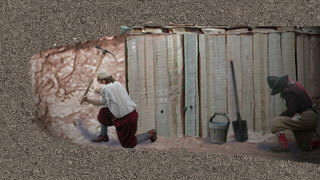 As they dug, they secured the walls and ceiling with wooden frames and props. Presumably, dirt removed could have been piled around the top of the shaft and along the sap. If the gallery was long and the shaft deep, ventilation became a problem. No mention is made of a canary as a warning device like 19th century miners used, but candles guttering out and men gasping strongly hinted the air was foul. Several means were employed to ventilate the workings. One was to set up a frame with a large sheet of cloth at the top of the shaft and the flapping of the cloth "fanned" air down. Another was to place in a pit adjoining the top of the shaft a fire that, as it burned, drew air up and out. Both methods advertised the location of the shaft to the defenders, though. John Muller mentioned that a leather tube into the gallery was a consideration and air pumped down that tube by a bellows at the top. He preferred that conical holes be dug upwards every 40 meters or so along the length of the gallery and at the surface there would be small openings. The only drawback to that was, if discovered by the besieged, any hole would be an invitation to drop down some noxious substance or hand grenades. Close to the destination the diggers often changed direction of the digging to a right angle to the first gallery. After a distance of a few meters, the digging turned again at 90 degrees back to the original direction. The reason for that double angling (or to use the Americanism: "dogleg") was so that the intended explosion of gunpowder would not dissipate itself as much as it would down a straight tunnel (which would have also acted like a cannon barrel to bring the blast force right into the besiegers). Sometimes more than one dogleg was dug. If instead placing pilings, then burning them was the plan, then any dogleg was not necessary. At the end of the gallery, the chamber was dug out to hold the powder. This chamber was a room wider and usually lower than the gallery (though higher when necessitated by water seeping into the gallery). Next the chamber was lined with wood to make a large box, which was then lined with straw and sandbags "...to prevent the powder from contracting any dampness." The amount of powder put in depended on the depth from the base of the wall above (termed "line of least resistance"). John Muller devoted pages to formulas and tables for such - and for the size of the chamber to hold that powder. Besiegers earlier than Muller usually did not construct a special box but instead simply stacked barrels or bags of powder into the chamber. Gaps and spaces between the supports of the ceiling and walls outside the loaded box of the chamber were packed with dirt and manure to act like a sealant; the intent was to convey the full force of the blast up and not have its effect cushioned by airspaces. But in these days before electrically detonated charges, provision had to be made for a fuse. John Muller referred to a "saucisson" which one assumes was more like a thick fuse than the similarly named elongated fascine. The saucisson was placed within a wooden trough with straw all around it., and a cover was then nailed onto the trough. From the chamber into the adjoining gallery for as much as two meters, miners sealed off the chamber with dirt, stones and dung, ramming it in but taking care not to damage that covered trough, its end remaining out to be lit. When the chamber was prepared and the troops made ready to exploit a wall collapse, the fuse/saucisson was lit. The thunder from below heaved up the wall with force sufficient to break the legs of some defenders standing on it who were then flung into the air along with everything else around them. More like a fluid than a solid, the wall arched up, broke like spray of a crashing ocean wave against a rock, then fell back into the gouged-out earth. What had been a stout defense became in moments a rubbly ramp into the interior of the fort. John Muller, who wrote his guide in the mid 18th century, looked back on decades of methods of mining and placing charges being honed and refined. One imagines that in the period of our discussion, especially the first half of the 16th century, determining the size of the charge with regard to its depth and the nature of the wall above was instead: "I think that ought to be enough" and "A little more powder and we might take down that wall." Raimondo Montecuccoli casually remarked that 30 or 40 barrels of powder were sufficient to bring down a bastion. And how many blasts lost too much of their force because the powder had become damp or the chamber not prepared as Muller would have had it? Not surprising, considering the potential of losing the siege should any mining operation be successful, those inside the artillery fort sought to stop any mining with countermining. Once the breach was made, the besiegers had to reach it. They may have faced one last barrier - or two.